Probate is the judicial process whereby a will is “proved” in a court of law and accepted as a valid public document that is the true last testament of the deceased, or whereby the estate is settled according to the laws of intestacy in the state of residence of the deceased at time of death in the absence of a legal will. Intestacy.. is the condition of the estate of a person who dies without having made a valid will or other binding declaration. Alternatively this may also apply where a will or declaration has been made, but only applies to part of the estate; the remaining estate forms the “intestate estate”. Intestacy law, also referred to as the law of descent and distribution, refers to the body of law (statutory and case law) that determines who is entitled to the property from the estate under the rules of inheritance. Our first downloadable splspro document, one that every (wo)man requires, or your estate is left in Probate/Intestacy. 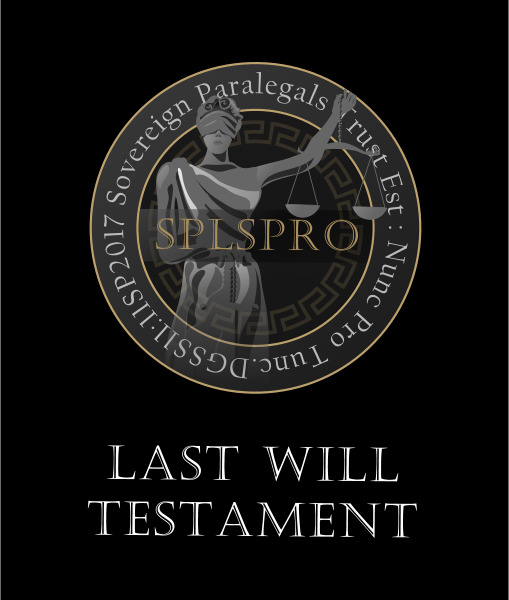 This is a basic last will and testament, it is certainly not suitable for all, the will can be added to or taken from. is the condition of the estate of a person who dies without having made a valid will or other binding declaration. Alternatively this may also apply where a will or declaration has been made, but only applies to part of the estate; the remaining estate forms the “intestate estate”. Intestacy law, also referred to as the law of descent and distribution, refers to the body of law (statutory and case law) that determines who is entitled to the property from the estate under the rules of inheritance. A Will is a legally binding document that sets out the wishes of the person making it (the “Testator”) regarding the distribution of their worldwide property and assets. This document may only be used by Testators who are at least 18 years old. This document is not appropriate for people who have complex assets requiring specialist provisions, minor children under 18 years of age, grandparents who wish to leave assets to grandchildren or those who wish to set up separate arrangements for domestic and foreign assets. (d) The Testator must have no disorder of the mind that perverts their sense of right or prevents the exercise of their natural faculties in disposing of their property by Will. A Will is the key document for the executors of an estate when the Testator dies. The Will names one or more executors who have been entrusted with the duty to carry out the wishes of the deceased. It also provides the executors with instructions on how the estate should be distributed. A typical Will provides that all debts of the estate including taxes should be paid first. It names one or more executors, who will be responsible for administering the estate and one or more alternate executors if the named executor(s) are unable to act. A Will then sets out any specific gifts of personal possessions or money that are to be made. Whatever is left after all of the specific gifts have been given and all debts have been paid is called the Residue Fund in this document. A Will should contain a residue clause specifying how the residue should be distributed. The residue is often the largest part of an estate, but its value will depend on the assets and debts of the Testator at the time of his or her death and cannot be determined at the time the Will is made. The larger the specific gifts or debts, the smaller the Residue Fund. (f) The Testator changes their mind about the provisions in their Will. This document incorporates the Standard Provisions and all of the Special Provisions of the Society of Trust and Estate Practitioners (2nd Edition) (STEP) which deals with the powers of the executor(s). More information on the STEP provisions can be found on the STEP website. (III) Wills where minor children will be beneficiaries. If the Testator has children under 18 years of age and wishes them to inherit all or part of the estate then the Testator must decide which type of trust is required for the children before completing this document. If the Testator does not understand trusts for children or is unsure of which type of trust to choose, then legal/taxation advice must be sought from a solicitor and/or a tax planning expert. Such professionals will be able to advise on which type of trust best suits the Testator’s situation. This document provides for each of the main types of trust. This Will only provide for the first 3 types of trust (Bare Trust, Trust for Bereaved Minors and an Age 18 – 25 Trust). This document should not be used if the Testator wishes to set up an Immediate Post-Death Interests Trust (IPDI) or a Discretionary Trust for minor children. The key features of the 3 types of trust available in this document are set out below. There are also different tax implications relating to each type of trust and a Testator must understand such tax implications in order to ensure that the most suitable trust is selected. A Bare Trust can be created by any Testator for a minor child. Under a Bare Trust the only thing preventing a child from inheriting their share or all of the Residue Fund is the fact that they are under 18 years of age. At age 18 the minor child can call for their inheritance. The inheritance belongs to the minor child and accordingly if the minor child dies or faced claims against their assets, the inheritance would be considered the minor child’s asset and as such would pass under the rules of intestacy. Income or capital of the inheritance could be applied for the minor child’s benefit at any time before their 18th birthday. A TBM can ONLY be created by a parent of a minor child. Under a TBM the child will be entitled to the capital of their inheritance at 18 years of age, but capital may also be paid out for the child’s benefit before their 18th birthday. The child’s trustee has discretion over whether to pay out the trust income, but income can only be applied for the minor child’s benefit. The inheritance does not belong to the child until their 18th birthday, so cannot be subject to claims against the child. The terms of the TBM govern what happens to the inheritance if that child dies under 18 years of age and is not governed by the rules of intestacy. There are tax advantages to this type of trust compared to a Bare Trust. An Age 18 – 25 Trust can ONLY be created by a parent of a minor child. An Age 18 – 25 trust is similar in terms to a TBM, except this trust allows the minor child’s trustee to hold the inheritance until they believe the child can manage the inheritance responsibly (anytime up to age 25). (a) If the Testator wishes to set up a Discretionary Trust or an Immediate Post-Death Interests (IPDI) for minor children. (b) If the Testator is not sure of which type of trust to choose and has not sought professional trust planning advice. (c) If the Testator does not understand the tax implications of the different types of trusts and has not sought professional taxation advice. (d) If the Testator is the parent of a minor child with a limited life expectancy who is likely to die before reaching 18 years of age. (e) If any minor child has disabilities requiring ongoing specialist care. (f) If the Testator is a grandparent and wishes to leave assets to their minor grandchildren. This document should be completed in full and printed. The Will must then be signed by the Testator and two witnesses at the same time in the presence of each other. The witnesses must not be beneficiaries under the Will. The Testator must also put their initials on the bottom right hand corner of each page of the Will. The signed and witnessed Will must be kept in a safe place and the appointed executor(s) should be told where they can find it. Alternatively, copies of the signed Will can be given directly to the executor(s).